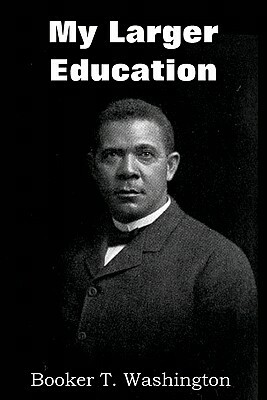 Booker T. Washington was an American political leader, educator and author of African ancestry, best known for his tenure as President of Tuskegee University. In My Larger Education, Washington writes on how he came by his positions on race relations describing the people who influenced him. Washington was constantly criticized by his contemporaries for being too conciliatory to whites and not concerned enough about civil rights. It would not be until after his death that the world would find out that he had indeed worked a great deal for civil rights anonymously. "I am afraid that there is a certain class of race-problem solvers who don't want the patient to get well, because as long as the disease holds out they have not only an easy means of making a living, but also an easy medium through which to make themselves prominent before the public. My experience is that people who call themselves "The Intellectuals" understand theories, but they do not understand things. I have long been convinced that, if these men could have gone into the South and taken up and become interested in some practical work which would have brought them in touch with people and things, the whole world would have looked very different to them. Bad as conditions might have seemed at first, when they saw that actual progress was being made, they would have taken a more hopeful view of the situation.